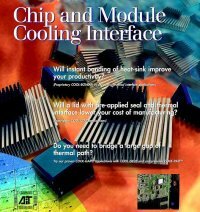 AIT pioneered the use of flexible thermal adhesives and phase-change materials as thermal interface materials (TIM) including thermal pads (COOL-PAD™) and the patented compressible phase-change material in the thermal management of microprocessors of personal computers, power converters and supplies. 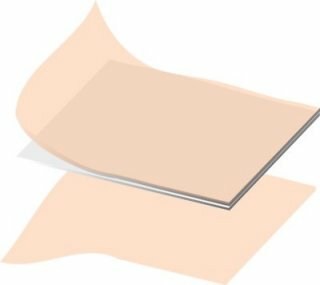 COOL-PAD™ is a phase-change thermal interface pad material that handles like a plastic sheet but flows and performs like a grease during device operation and shows 200-600% improvement observed in usage. COOL-BOND® is an innovative thermal interface material from AIT that is pressure sensitive and provides immediate bond strength and in-situ curing to achieve >1000 psi thermal adhesive bond for heat-sink and heat-spreader attachment for thermal management.COOL-BOND® provides unparalleled low thermal impedance with proven long-term reliability by not imparting any inter-facial bonding stress. These high performance thermal adhesives are available as a thermal paste, thermal film or thermal tape for ease of application. COOL-BOND® PSA 3TC is a thermal film that is pressure sensitive to provide instant bond strength of over 100 psi that increases to a bond strength to over 1000 psi with heat on the interface generated by the power components or power modules. COOL-GELFILM™is another AIT innovation. It is a thermal interface gel in film form for ease of application for critical thermal interfacing requiring high reliability without heat of provision of clips or pressure. COOL-GELFILM™ is a film thermal gel that can be applied without mess or spreading into unwanted areas. Once applied, it provides both instant tack and flow to minimize thermal resistance. COOL-GAPFILL™ is yet another of AIT's enhanced thermal gap-filling materials that provides extreme thermal conductivity and thus unparalleled thermal interface resistance for board level multiple component thermal management. It is designed to provide conformability and compressibility to bridge the thermal gap of large boards and sensitive components. It is non-phase changing and silicone free and thus will not contaminate components. COOL-GAPFILL™ offers an outstanding conformal capability to compensate for height differences of components in a circuit module or circuit board to efficiently spread out the heat generated. It is available with one or both sides tacky for different applications. With continuous improvements and innovations, AI technology has made a patented compressible phase-change thermal pad as thin as 1 mil available for volume production use at the lowest possible measured thermal resistance. 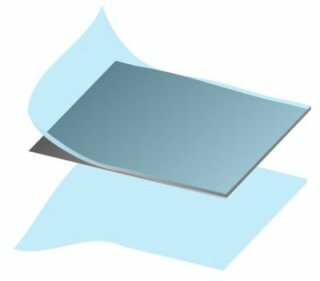 These thin bond-line thermal interface materials have proven effective in some of the most demanding thermal applications in industrial and computer gaming applications. AI Technology has also applied its high thermal conductive solutions to high temperature inter-penetrating polymer network materials to provide a CTE matched aluminum and copper clad thermal insulated metal substrate for high power and/or high temperature electronics applications. Measured with a thermal resistance lower than all available industry "standards" and less than 0.005°C-sq.in/W, AIT thermal gels (COOL-GEL®), thermal greases (COOL-GREASE®) and COOL-PADS™ have proven themselves as the standard for the best thermal interface materials. COOL-SILVER™ has been tested and proven to surpass the best of thermal interface greases ever used in the overclocking computing community by a wide margin. AIT has recently enhanced the thermal resistance reduction for some of the most critical applications in cooling CPU. The following chart represents the results based on the measurements in December 2009 comparing all of the best performing thermal greases that have been tested by "BenchMark Review.com" with the third generation COOL-SILVER™ GREASE. The same performance is now available with an easier than ever to use patented compressible phase-change COOL-SILVER™ PAD that measurably outperforms the best competitors in both thermal greases and pads. Comparison of Thermal Interface Materials Performance: Lower temperature rise represents a measurement of the efficiency of the thermal interface material in transferring heat generated by the power electronic device to the heatsink (with fan) that dissipates heat to the environment by forced circulating air. The thickness of the thermal interface material also contributes significantly to the efficiency of heat dissipation and should be minimized as much as the physical configuration or construction permits. The effectiveness of a specific thermal interface material cannot be easily predicted by the claimed or even measured bulk thermal conductivity data or value: the thermal resistance of the thermal interface material to the substrate in its respective interface for a thin bond-line or interface thickness is significant and represents the "coupling efficiency" that cannot be predicted and must be measured. The data in the comparison of thermal interface materials is collected by using an Intel CPU and forced air heat-sink as represented in the above configuration. A thermocouple is drilled and embedded at the heat-sink junction that interfaces with the thermal interface material to provide direct temperature data at the interface for measuring the "coupling" of the specific thermal interface materials to the heat-sink. Poor thermal management leads to more than 50% of electronic failures. AIT pioneered the first phase-change thermal adhesives in the early 1990's. AIT's products include many innovative forms of pastes and film thermal adhesives designed to both optimize heat transfer and improve the reliability of electronic devices during thermal cycling. The failure rate for electronics increases exponentially with the increase in junction temperature. Specifically, the failure rate of an electronic device doubles with every 10°C increase in chip junction temperature. The ability to transfer and dissipate heat generated at the chip level directly affects the system's reliability. Efficient thermal transfer depends directly on the ability of thermal interface materials to fill in all interfacial voids and avoid creating internal voids of their own. Thermal interface materials must also have outstanding thermal conductivity. All of AIT thermal interface materials of thermal adhesives, thermal greases, thermal gels and compressible phase-change thermal pads are engineered and manufactured to satisfy these criteria. In side-by-side performance testing of thermal interface materials, as represented below, COOL-SILVER™ G3 thermal grease, thermal gel, and COOL-SILVER™ thermal pads demonstrated more than 2-4°C lower junction temperature for the same medium performance CPU. The same applications for higher performance CPU and processors will accordingly yield even more dramatic thermal improvements and thus faster clock speed and lower junction temperatures. Need an N.D.A. 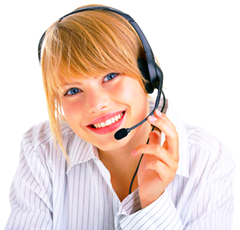 (non-disclosure agreement), no problem, just get in touch.